As a young boy at the Bergen-Belsen concentration camp, Moshe Peer says he was sent to the gas chambers at least six times. 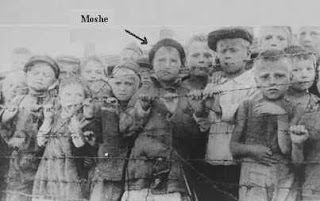 To this day, Moshe doesn't know how he survived. He still has nightmares about the horror. Moshe is most angry that the entire world, as he says, "stood by and let it happen." The entire world is guilty of the Hoaxacaust, and should never forget and never allow it to happen again. 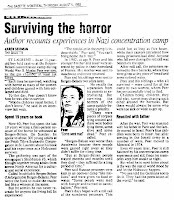 ST. LAURENT - As an 11 year-old boy held captive at the Bergen-Belsen concentration camp during World War II, Moshe Peer was sent to the gas chamber at least six times. 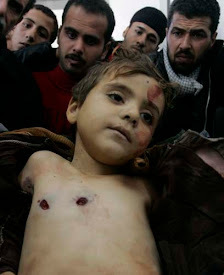 Each time he survived, watching with horrors as many of the women and children gassed with him collapsed and died. To this day, Peer doesn’t know how he was able to survive. “Maybe children resist better, I don’t know,” he said in an interview last week. The gathering was part of the synagogue’s Shabbaton 93, which brought together young adults from across North America for a cultural and social experience. “There were pieces of corpses lying around and there were bodies lying there, some alive and some dead,” Peer recalled. Peer said Russian prisoners were kept in an open-air camp “like stallions” and were given no food or water. “Some people went mad with hunger and turned to cannibalism,” Peer said. Peer’s day began with a roll call of the numbered prisoners. This could last as long as five hours, while their captors calculated how many prisoners had died. Anyone who fell over during the roll call was beaten on the spot. After roll call, the prisoners returned to their barracks, where they were given a tiny piece of bread and some coloured water. Peer and his siblings - who all survived - were cared for at the camp by two women, whom Peer has unsuccessful tried to find. After the war, Peer was reunited with his father in Paris and the family moved to Israel. Peer’s four children were born in Israel, but after serving in the Israeli army in a number of wars, Peer moved to Montreal in 1974. Even 49 years later, Peer is still haunted by his concentration-camp experience and still finds his memories keep him awake at night. “No one told the Germans not to do it. They had the permission of world,” he said. pro-Holohoax site cites Moshe Peer's "testimony"
The only "gas chamber" poor Moshe could have possibly survived six times would be delousing chambers designed to kill lice and other parasites in order to prevent disease. Delousing chambers were the only type of "gas chambers" at any of the German camps. Also note that Peer claims there was a "homicidal gas chamber" at Bergen-Belsen (located on German soil), but now even proponents of the 'official' holocaust story admit that there were no "homicidal gas chambers" at any of the camps on German soil. - Jews alleged a "holocaust" of "6 Million" Jews in Romania, Poland and Ukraine in 1919 at end of WWI !!! - The Nuremberg "trials" admittedly did not follow Western rules of evidence, and did not require proof of the crimes alleged as they were termed "facts of common knowledge". They were admittedly a propaganda display for the "continuation of the war efforts of the Allies"! !